When government bulldozers flattened houses in Kibera two weeks ago and left over 20,000 people homeless, most of Nairobi's middle and upper class thought nothing of it, chalking it to just one more way in which life punishes the economically disadvantaged in this country. 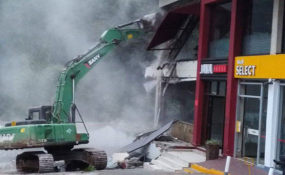 However, the recent spate of demolitions this week have been targeted at Nairobi's posher addresses, indiscriminately bringing down restaurants, houses, swimming pools along with perimeter walls and even entire malls, as happened at South End Mall on Lang'ata Road yesterday. It is a season of reckoning for individuals who have spent a fortune to erect structures in Nairobi that are now being demolished, and the National Environment Management Authority (Nema) says there will be no looking back. Nema director-general Geoffrey Wahungu says they have a list of "quite a few" structures, whose exact number he could not disclose, and that the authority will be pouncing "at our own time to pull down sections of buildings that are closer than six metres from riparian reserves". "What I can tell citizens who are encroaching on riparian land is that all the notices we gave are expired," Prof Wahungu told a local TV station on Tuesday. Owners of buildings brought down will be seeing more dust as they will have to reimburse Nema the costs incurred in tearing them down. "They will pay us for the equipment. And therefore, it is good for them to start early and demolish before we come," said the Nema boss. Of note, he said, is that they are only demolishing sections of buildings that defy the six-metre setback limit from the Nairobi River. "All the demolitions we are doing now were sanctioned in 2016, that is two years ago by an inter-ministerial presidential committee. Three months ago, we marked them again and gave these people notices. And even after three months we did not act for another two weeks. So, there has been adequate notice and no one can complain that they did not know," said Prof Wahungu. Buildings torn down so far are in areas that include Grogan, Kileleshwa and Lang'ata. While some think that demolitions are a good move, others say that it is evidence of failure by Nema to stop construction of the building before it starts and has only served to put hapless tenants out on the streets while unscrupulous developers go untouched. Efforts to reach Nema to get a definite list of buildings on road reserves were unsuccessful, but satellite photos show that Nairobians have heavily encroached on riparian lands and choked rivers forcing them to alter their course in some cases. Ms Peninah Mutonga, an architect with city firm ArchiDatum, told the Nation that the process of approving buildings is so stringent that were it followed properly, Nairobi would have been able to protect its waterways from the beginning. "An architect submits a proposal to the Nairobi City Council, ensuring that it meets the building code, planning guidelines and zonal guidelines. The council puts together a team comprising of planning officers and officials from the health inspectorate and development control to review the proposal and OK it," she said. Once okayed by the county, the proposal is forwarded to Nema which gives the greenlight after ensuring that all environmental considerations, key among them protection of riparian reserves, have been met. But the system, while it looks fail-safe on paper, is made of fallible human beings who have distorted it to serve their own interests. "Developers are able to flout building regulations by bribing officials to approve plans that do not meet the required standards, which is one of the reasons why we have ended up with so many buildings on riparian land," said Ms Mutonga. According to Ms Mutonga, many apartment blocks in Kileleshwa do not meet the required distance from waterways, as are other developments in Spring Valley and Brookside, both lush suburbs in the northern part of the city. Prof Wahungu says owners of such buildings have been getting clearance to build while keeping a six-metre distance from the river, but they have often ignored that directive. Given that Nema has been unable to monitor every construction, he said, the encroachment on rivers happens. He, however, added that now as Nema works towards meeting a timeline by the Nairobi Regeneration Programme -- an initiative of President Kenyatta that is co-chaired by Nairobi Governor Mike Sonko and Tourism Cabinet Secretary Najib Balala -- there will be strict checks on compliance. "Now we have the resources and the capacity to do these demolitions. And we have been planning for them and now we are prepared and we are doing it," said the Nema boss. "By the end of this exercise, we are going to leave no structure on the riparian." More pain is on the way for illegal property owners in the city as the Nairobi County administration is expected to pull down more structures from Saturday when a 14-day ultimatum issued by Governor Sonko to those who had constructed unlawful structures will expire. County officials yesterday equally did not reveal the exact buildings targeted.